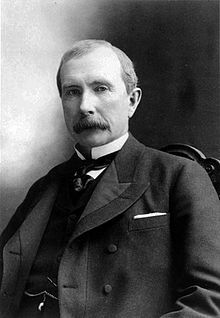 John Davison Rockefeller was a Christian, an industrialist and a great philanthropist who founded, among other institutions, the University of Chicago and The Rockefeller Institute for Medical Research (now known as Rockefeller University) in New York City. Born in 1839 to William and Eliza Rockefeller, John was the second of their six children and their oldest son. In contrast to his father, who was known as an unproductive schemer, John gained a great reputation for being an honest, generous Christian. From his work in the oil industry to his interest in education and science, Rockefeller had a significant, lasting impact on others. In fact, through the trusts and foundations he established, Rockefeller shaped modern philanthropy. Thus, he was the first American worth more than a billion dollars and, when accounting for inflation, many regard him as the richest person who has ever lived. Rockefeller was a conservative Baptist who believed that a strong relationship with God was necessary for honest, meaningful, lasting work. For that reason he always sought to partner with other Christians who shared such views. As was noted earlier, Rockefeller believed in the importance of generosity. In fact, he tithed ten percent of his first paycheck to his local church and maintained that discipline throughout his life. With his high value on education, Rockefeller helped fund colleges like Spelman College, which was named after his in-laws. Rockefeller also supported missionary work. In 1905, he gave a grant to the American Baptist Missionaries to help establish Central Philippine University, the first Baptist University in Asia. He also supported Ivy League schools such as Yale, Harvard, and Brown. In 1913, he created the Rockefeller Foundation which gave to public health, medical training, and the arts. This foundation endowed Johns Hopkins and it built the Peking Union Medical College in China. But he did not merely fund causes. He also invented certain ways of giving that are still used today. For example, he created the conditional grant, which promoted both recurring donations and the opportunity for donors to oversee the mission and value of the organizational recipients. Rockefeller died of arteriosclerosis in 1937, two months before his 98th birthday. All throughout his life, he knew (in his own words), “God gave me money” and so he embraced John Wesley’s saying, “Gain all you can, save all you can, and give all you can.” Or, as Ephesians 4:28 says, “Let the thief no longer steal, but rather let him labor, doing honest work with his own hands, so that he may have something to share with anyone in need.” Thus, instead of scheming in business as his father had done, Rockefeller worked hard so that he could earn money so that he could in turn give to others.